You will probably decide to take your female cat spaying for various reasons. Spayed cats don’t wonder around as before the procedure and you will know your loving cat is safe. She will not call in season any more and will not attract male cats. Above all, you will not have to deal with many kittens and searching for the right home for them. A spay is a permanent method of birth control for cats. It is known as ovariohysterectomy and represents surgical removal of ovaries and uterus of female animals. It is performed under general anesthesia and generally it is a safe and quick procedure. Female cats should be spayed when they are about 6 months old. Cat spay is associated with several possible complications that may occur during or after the surgery. Spayed cats will commonly experience pain after the procedure. You will notice that your cat is walking stiffly and breathe heavily. Cat may tremble, growl and bite the stitches. You may notice that your cat lacks appetite, which is commonly due to pain. 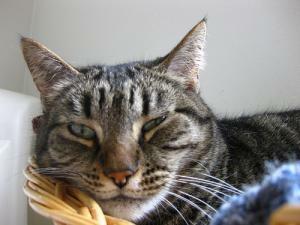 Veterinarians recommend reducing your cat’s activity and keeping it inside to relieve the pain. This way you can prevent injuries to the surgical site as well. Additionally, you can give prescribed painkillers to your cat. Sometimes, internal bleeding may occur as post-surgical complication. This may happen in case of failure to properly ligate the uterine or ovarian blood vessels. Internal bleeding can be recognized by weakness, pale gums, distended abdomen, depression and anorexia. Internal bleeding requires immediate medical attention. Wound infection is another complication of cat spying. If you don’t prevent your cat to lick the surgical site it will be more susceptible to an infection. Wound infection may occur if area of incision comes in contact with feces, urine or dirt too. It is important not to allow cat’s incision to get wet. You must regularly check for the signs of wound infection such as swelling, redness and discharge. If you notice any of these signs, inform the veterinarian. Wound infection is commonly treated with antibiotics. Break down of the skin stitches often occurs in spayed cats. This usually happens because cats lick the wound, or if it is excessively active after ovariohysterectomy. If you notice incision breakdown in your cat, inform your veterinarian. Swelling at the spay operation site is a fairly common post-surgical procedure. There are different forms of swelling: inflammatory swelling, seroma, hernia and abscess. Inflammatory swelling can be result of healing process or trauma in the tissues around the incision. Seroma represents formation of a large lump at the surgical site. Hernia represents protrusion of internal organs through the abdominal wall. Abscess is infected seroma which can be hot and painful.